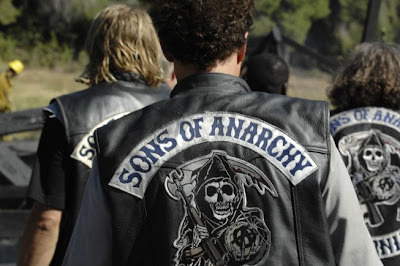 Sons of Anarchy follows SAMCRO, the Sons of Anarchy Motorcycle Club, Redwood Original Charter. Charlie Hunnam stars as Jax Teller, Vice-President of SAMCRO, and son of original founder, the late John Teller. His mother Gemma (Katey Sagal) married Clay Morrow (Ron Perlman) one of the original members of the club, and now, its president. SAMCRO is a close-knit group with a deep love for family, but they primarily make their money from illegal gun-running. The law turns a blind eye to SAMCRO's activities because they keep their home base, the fictional town of Charming, free of drugs. This brings them in conflict with rival gangs such as the Latino "Mayans", and the white supremacist "Nords" led by Ernest Darby (Mitch Pileggi), who both want to bring meth to Charming. With ambitious new Deputy Hale (Tayler Sheridan) keeping an eye on them, the club has their hands full. Kurt Sutter (The Shield) created the show, which is quite original for TV. As the paragraph above describes, there are many potential avenues for exploration of the interesting biker subculture set up in the pilot. The club walks the line between being small-town heroes and selfish outlaws, admirable for their defense of Charming, but crooked enough to allow a shipment they're running for the corrupt Sheriff Unser (Dayton Callie) to be robbed in order to coax the sheriff out of making any plans to retire. Like The Sopranos, the most interesting storyline is found in the central characters' family dynamics. Jax is dealing with the premature birth of his son, Abel to Wendy (Drea De Matteo), his drug-addicted ex-wife. He has also found a manifesto written by his late father, that leads him to believe that the original concept of SAMCRO was a far less sinister one, the establishment of a haven for like-minded anti-authoritarian men returning from duty in Vietnam. Jax is starting to question the direction his stepfather, Clay, has in mind for SAMCRO. And the person who seems to be pulling everyone's strings? Jax's mother, Gemma. Sagal attacks the part of Gemma with relish. Sweet and tender in her dealings with Jax, she takes on a more frightening countenance when trying to convince Wendy to make everyone happier by overdosing on crank... and giving her the loaded needle to do so. When Gemma informs Clay that Jax has discovered his dad's writings, it's not Clay who feels threatened. It is Gemma who has solidified her position of power over the club and its families, able to manipulate the smitten Clay, and fearful of losing her standing should Jax bring these ideas into the open. If the show continues its trend of strong casting, good directors, and storytelling with an eye to its definite Shakespearean origins, the strikingly original Sons of Anarchy should be the next cult hit. Sons of Anarchy airs Wednesdays at 10:00 p.m. on FX. Stills provided courtesy of FX Networks, LLC.